Flat beans or green beans, this recipe easily substitutes with other hard vegetables and adapts easily for a vegetarian style without adding meat. Serves as a main or a side-dish with more guests and dishes. 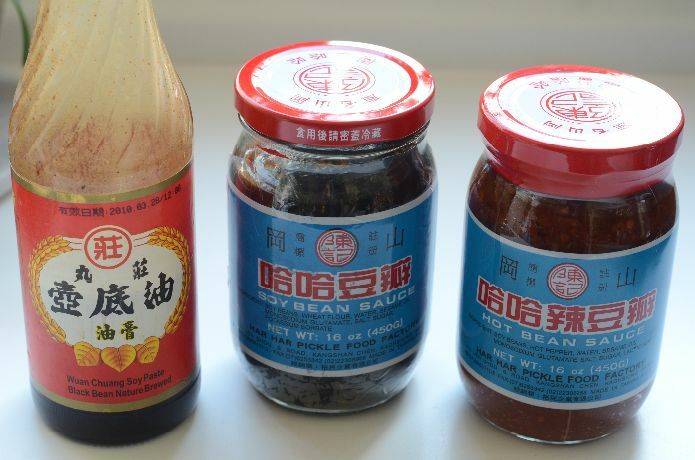 1½ tablespoons bean sauce substitute hotbean sauce, or mix half of each 1 tbl. 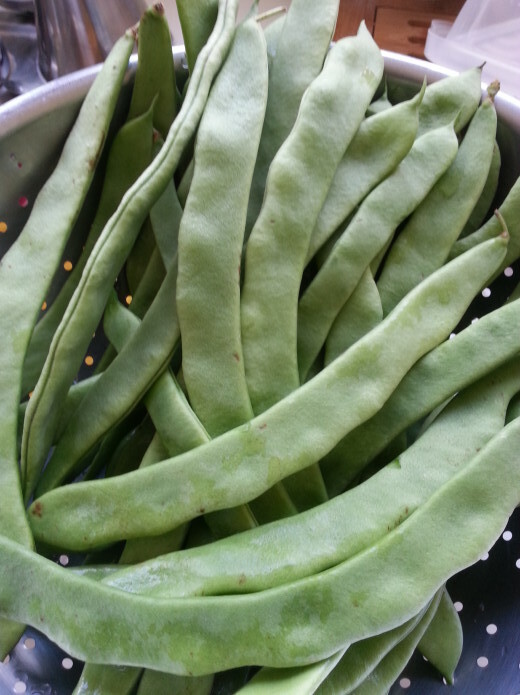 Wash and cut flat beans diagonally 2cm wide, the angle will resemble diamond cut vegetables. Slice the onion and mash the garlic. Prepare ahead: Add the cornstarch to ½-¾ cup of water, stir till solved and thickens. This 'slurry' is to bind the sauce at the end, have it stand-by. 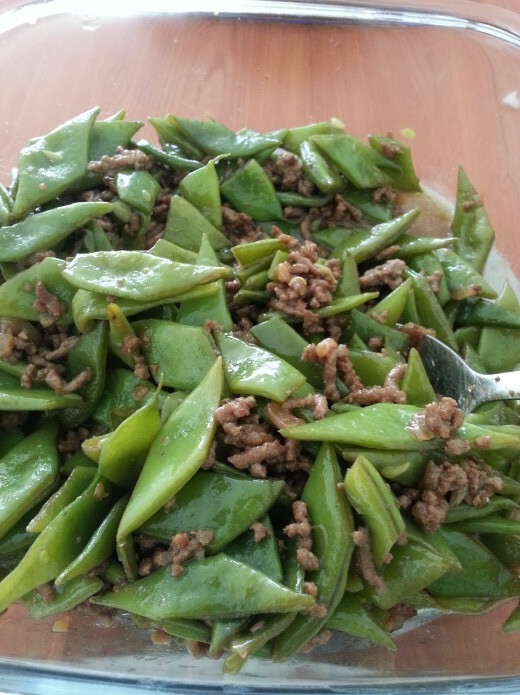 Heat up the wok/saute pan, add oil when it smokes add the ground meat and keep stirring around till browned all over. Add the onion and garlic keep stirring till aroma appears. 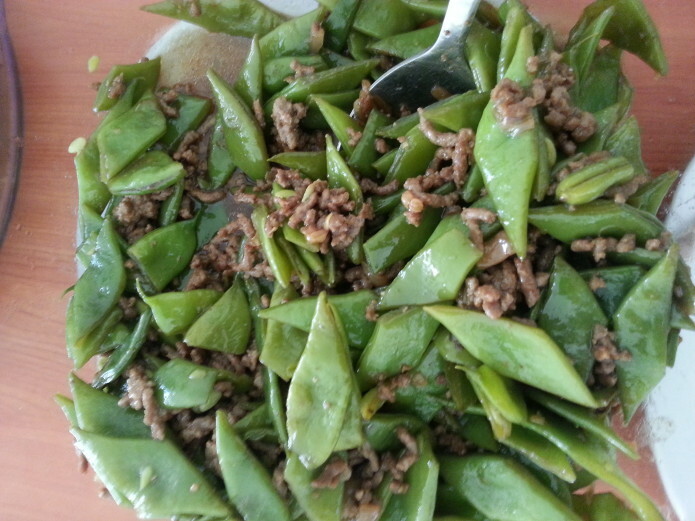 If you like to speed up cooking, zap the sliced flat beans in microwave for 5-7 min. Drain water. Vegetarian style; begin with oil in the wok/saute pan heat and add onion first 1-2 min stir, add garlic than followed by diamond cut flat beans, stir around and add bean sauce, continue with steps of adding flavorings. Put the lid on for 7 min or less (depends pre-cooked or not), if not sure watch the color of greens turning bright green or bite to check the level of crunchiness. Non-vegetarian style: Add the beansauce with the ground meat, keep stirring till it is incorporated than add Chinese cooking wine, stir. 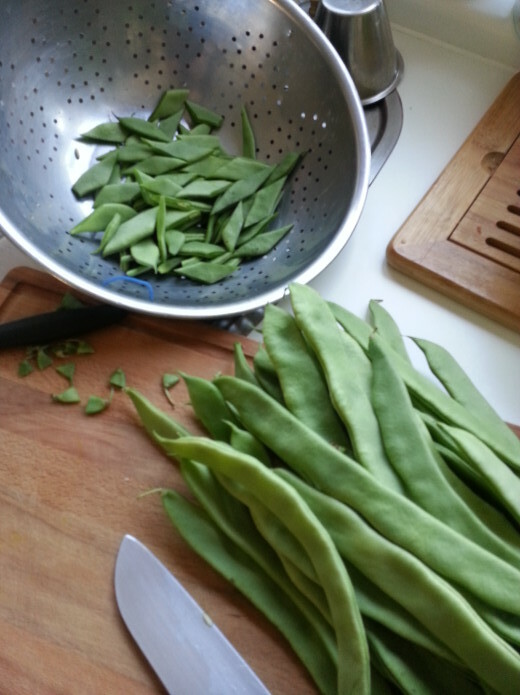 Add the diamond cut flat beans, keep stir-frying. Followed by chicken powder, light soy sauce, stir put the lid on for 5-7 min if not pre-cooked. If pre-cooked, stir again add the thickening prepared slurry (give a good stir in the cup so it is liquid and not with solids), stir everything through. Put the lid on for 2min. Take the lid off, taste add salt & pepper, adjust if needed and serve with white rice.